Helix Oil Skimmer being deployed off the USCGC HEALY. The Army Corps of Engineers was Engineers (USACE) Engineer Research and ice. 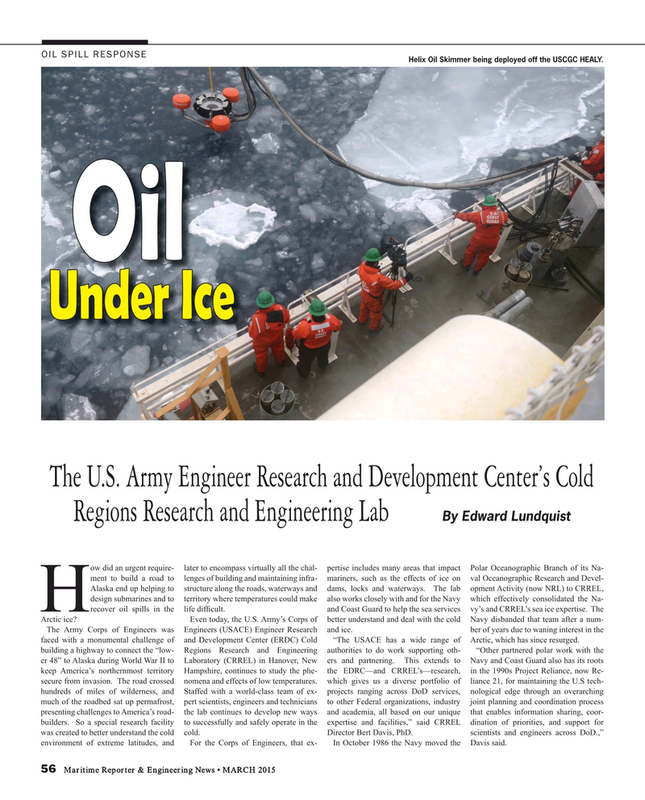 ber of years due to waning interest in the faced with a monumental challenge of and Development Center (ERDC) Cold “The USACE has a wide range of Arctic, which has since resurged. building a highway to connect the “low- Regions Research and Engineering authorities to do work supporting oth- “Other partnered polar work with the er 48” to Alaska during World War II to Laboratory (CRREL) in Hanover, New ers and partnering. This extends to Navy and Coast Guard also has its roots keep America’s northernmost territory Hampshire, continues to study the phe- the EDRC—and CRREL’s—research, in the 1990s Project Reliance, now Re- secure from invasion. The road crossed nomena and effects of low temperatures. which gives us a diverse portfolio of liance 21, for maintaining the U.S tech- hundreds of miles of wilderness, and Staffed with a world-class team of ex- projects ranging across DoD services, nological edge through an overarching much of the roadbed sat up permafrost, pert scientists, engineers and technicians to other Federal organizations, industry joint planning and coordination process presenting challenges to America’s road- the lab continues to develop new ways and academia, all based on our unique that enables information sharing, coor- builders. So a special research facility to successfully and safely operate in the expertise and facilities,” said CRREL dination of priorities, and support for was created to better understand the cold cold. Director Bert Davis, PhD. scientists and engineers across DoD.,” environment of extreme latitudes, and For the Corps of Engineers, that ex- In October 1986 the Navy moved the Davis said.